Milam Glacier flows south from the summit of Trisul in the Indian Himalaya. 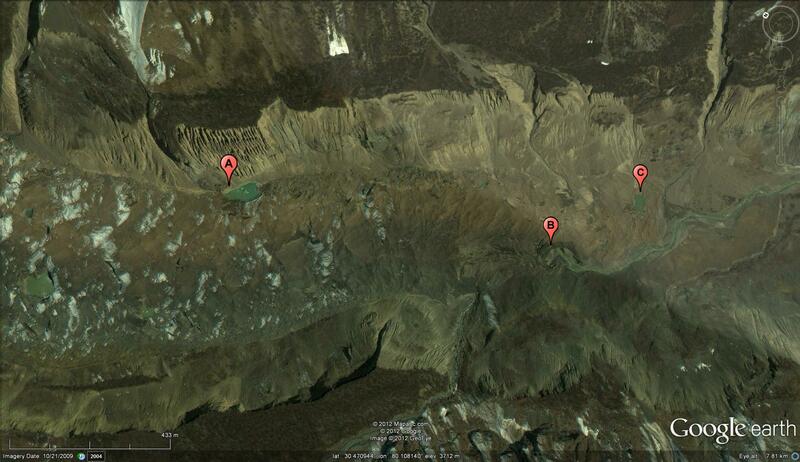 The glacier is fed by a number of tributaries flowing off the north ridge of Nanda Devi as well. 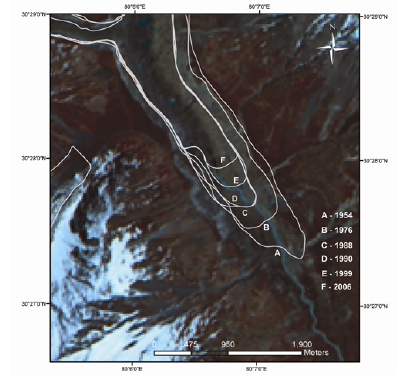 A recent paper by Raj (2011) documents the retreat of this glacier from 1954-2006. 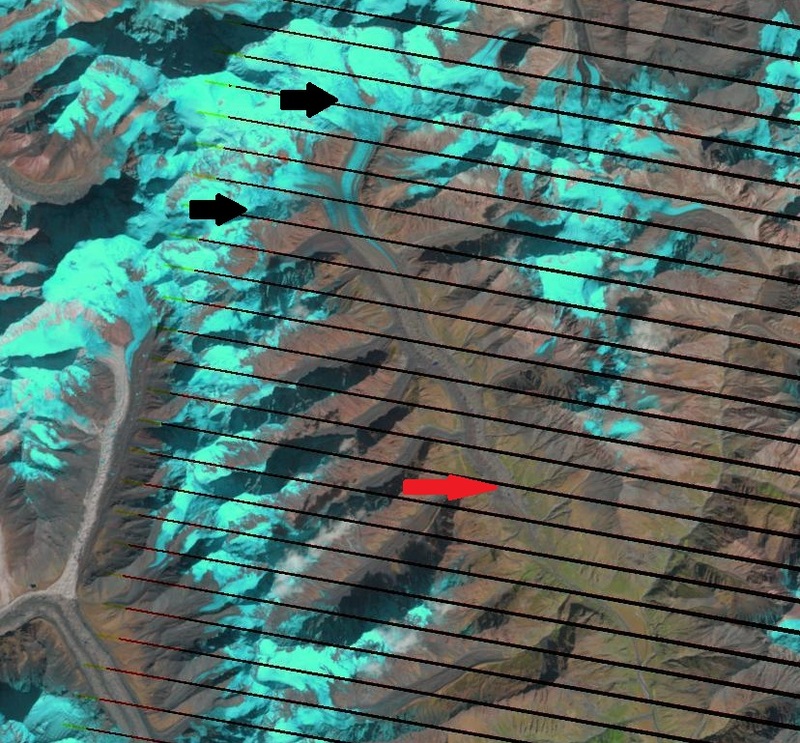 In the October 16, 2011 satellite image below, the snowline is at 5100 meters (black arrows) and the terminus at 3600 meters (red arrow). The accumulation zone stretches from the icefall regions at 5000-5200 meters to near the summit of Trisul at 7000 meters. From 1954-1976 Milam Glacier retreated at 20 Meters/year, 440 m. From 1976 to 1990 retreat was still 20 meters/year, 290 m. From 1990-2006 the glacier retreated 40 meters/year, 600 meters. The image below is from the Raj (2011) paper. Raj et al (2014) note that the glacier has retreated 480 m from 2004-2011 an acceleration. 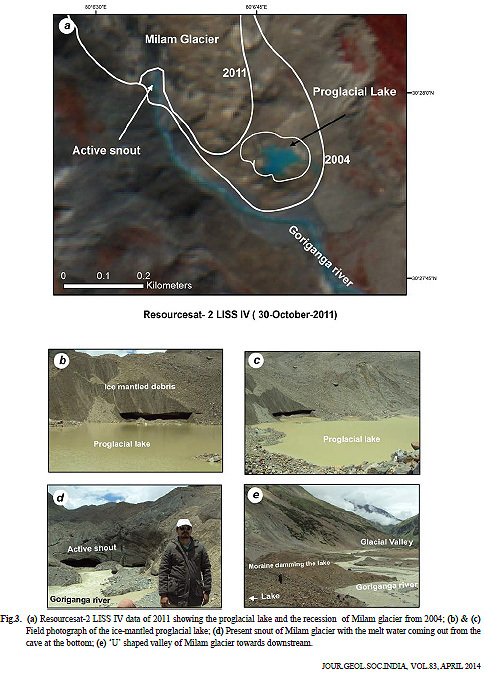 They further note an increase in the number of ponds and their size on the glacier, with the growth of 47 notable ponds on the glacier surface (Note their Figure 3, below). The Milam Glacier feeds the Gori Ganga River where a 370 MW hydropower system is anticipated to be built, the system will be a run of the river hydro project. 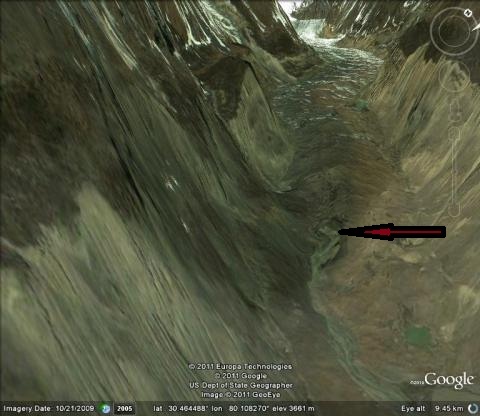 A closeup view from Google Earth imagery of the terminus indicates its stagnant nature and the location of the glacier outlet stream emerging from the under the glacier is a good marker of the terminus, note arrow in top image below. 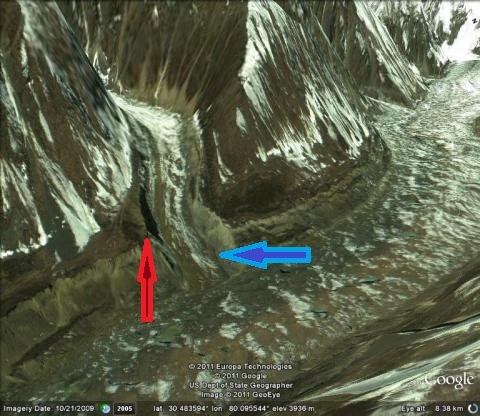 A comparison of 2004 (middle) and 2009 (bottom) indicate the stagnant debris covered nature of the glacier terminus area. A new lake has developed upglacier of the terminus at Point A after 2004. The lake beyond the terminus at Point C has expanded. 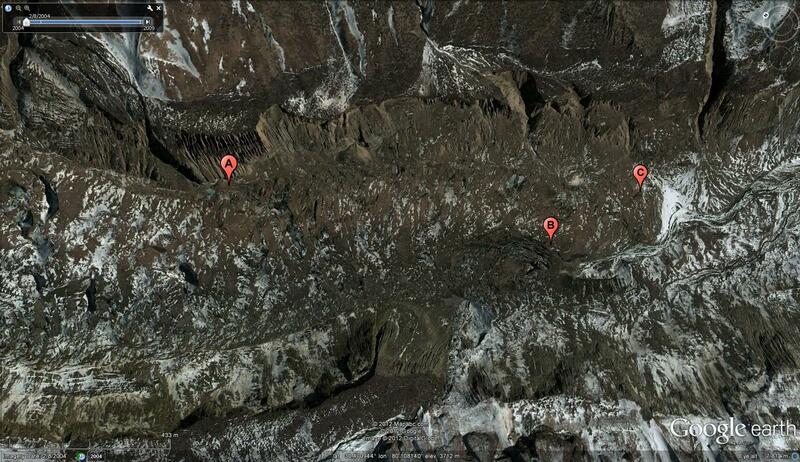 The terminus where the stream issues from under the glacier is at Point B. 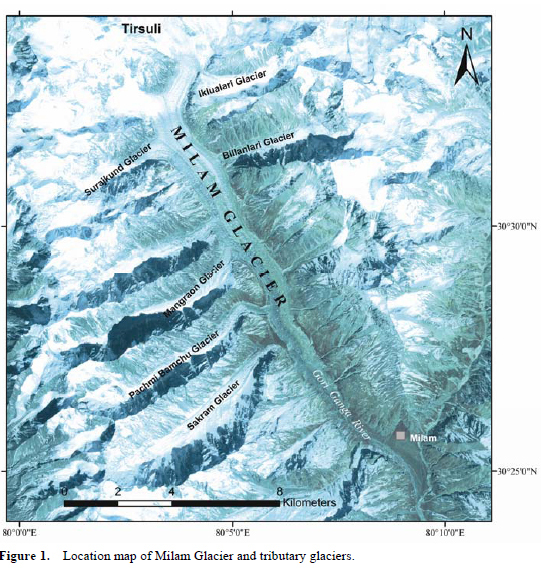 This entry was posted in Glacier Observations and tagged gori ganga glacier retreat, india himalaya glacier melt, india himalaya glacier retreat, Milam glacier retreat. Bookmark the permalink.